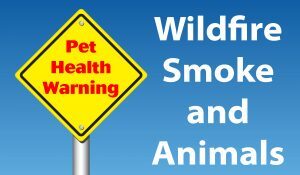 Our animals can also be affected by the wildfire smoke. OLYMPIA – Washington State Department of Health is encouraging people in areas affected by wildfire smoke to take necessary steps to protect themselves from poor air quality. • Visit the Washington Smoke Blog or contact your local regional clean air agency. • Stay indoors, avoid strenuous physical activities outside, and keep indoor air clean. Close windows and doors. Use fans or an air conditioner (AC) when it is hot, and set your AC to recirculate. If you do not have AC and it is too hot to stay home, go to a place with AC such as a mall or library. Remember to stay hydrated. Do not smoke, use candles, or vacuum. Use an air cleaner with a HEPA filter. • Contact your health care provider when you have specific health concerns, and dial 911 for emergency assistance if symptoms are serious.